Just as it says: the comments of a philosopher on the high and the low; world events, phenomena encountered and, occasionally, the esoteric happenings of academia. All Time Top 10 Posts on P.C. 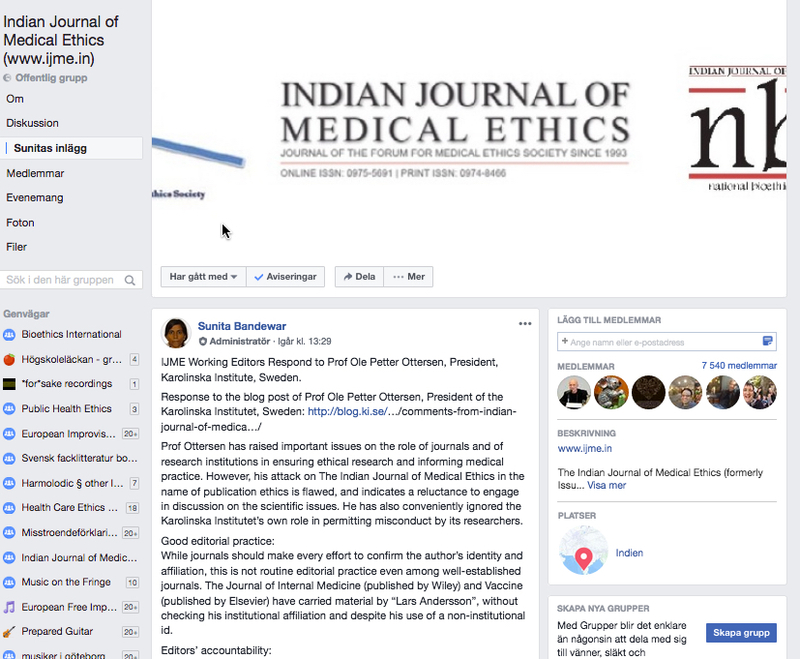 I have posted two times (here and here) about the deeply misguided decision by the editorial management team of the Indian Journal of Medical Ethics not to retract a fraudulent, obviously "antivaxx" propaganda piece, article. On invitation, I have also summarised my opinion on this matter at the Daily Nous philosophy blog. In all of these posts, I have strongly underscored the otherwise very promising track and strong reputation of this journal, the importance of this for the critical place of global health and developing country perspectives in bioethics scholarship, and my strong wish for a revised course by the IJME editorial management. It is therefore with the greatest satisfaction I have been reached by the news that the same management has now revised its judgement, and decided to retract the article in question, inviting publicity also from the widely read Retraction Watch blog. The retraction note is rather brief, but open and honest, and it speaks well of the integrity of the editorial management that it does not try to hide its own mistakes, or that the retraction occurred only as a result of pressure from the journal's editorial board and external commentators. It signs off by promising further elaborations in coming editorials. My hope is that these will set out clarified policies and routines that ensure that the journal in the future will keep strictly within its own declared area expertise and scholarship of "all aspects of healthcare ethics and the humanities, relevant to and/or from the perspective of India and other developing countries". This simple policy will save the IJME from any further scandals of the sort it has just escaped, and be a pillar for what I hope will be a further positive route of development of this otherwise excellent journal. However, on one point, I strongly disagree with the position set out by the editorial management, and that is its apparent decision to continue to hide the identity of the proven fraudulent author that used to call him-/herself "Lars Andersson", falsely claiming affiliation to Karolinska Institutet. The editors are hereby promoting further research fraud by this person, undermining both other journals and research institutions from protecting themselves against this person's future activities. It also impedes appropriate disciplinary action to be taken by the academic or other institution to which the person formerly known as "Lars Andersson" is indeed affiliated. Finally, it impedes any analysis into the vested or other conflicts of interests linking to this person's activity to attempt to peddle fraudulent antivaxx articles. The argument by the editors, that it has promised the author to keep his/her identity a secret is not only invalid. The action makes the editors complicit in any further research fraud undertaken by this person. The promise itself is morally void, as the editors had no business making it in the first place, their primary obligation being to the research community, and not to proven research fraudsters. It is my sincere hope that the further elaborations on editorial policy promised, possibly by help of further dialogue with the journal's editorial board, will lead to revision of judgement also regarding this particular point. Only the other day, I posted about "highly problematic" publication ethical decisions of the Indian Journal of Medical Ethics, and even more problematic positions taken when challenged. After having raised the issue in some closed facebook groups in my field, the initial concerns I had about the direction taken by the journal, have now deepened considerably. IJME Working Editors Respond to Prof Ole Petter Ottersen, President, Karolinska Institute, Sweden. Prof Ottersen has raised important issues on the role of journals and of research institutions in ensuring ethical research and informing medical practice. However, his attack on The Indian Journal of Medical Ethics in the name of publication ethics is flawed, and indicates a reluctance to engage in discussion on the scientific issues. He has also conveniently ignored the Karolinska Institutet’s own role in permitting misconduct by its researchers. While journals should make every effort to confirm the author’s identity and affiliation, this is not routine editorial practice even among well-established journals. The Journal of Internal Medicine (published by Wiley) and Vaccine (published by Elsevier) have carried material by “Lars Andersson”, without checking his institutional affiliation and despite his use of a non-institutional id. The comment by “Lars Andersson” ( http://ijme.in/…/increased-incidence-of-cervical-cancer-in…/ ) was reviewed by an external, international subject expert, an external statistician, a working editor with expertise in research methodology (Mala Ramanathan) and the manuscript editor (Sandhya Srinivasan) before being accepted for publication. When we were notified of the deception regarding the author’s identity and affiliation, we immediately removed the KI affiliation from the journal. We have explained our justification ( http://ijme.in/articles/statement-on-corrections/… ) for retaining the article on our website, and maintaining the author’s anonymity. Prof Ottersen does not explain how anonymity prevents scientific debate on an analysis of publicly available data. And he does not explain how “false affiliation” is relevant in the context of the IJME article which no longer carries any affiliation. He says that “leading researchers with intimate knowledge of the vaccination field have identified serious flaws in the published report and its conclusion, thus questioning the quality of the review process”. However, neither he nor these unnamed researchers have stated what those flaws are. The attack on IJME for maintaining the author’s anonymity ​appears to be to avoid scientific debate. We invite critical commentaries on the paper by “Lars Andersson” towards advancing the scientific debate on the issue at hand. The suggestion that false affiliation and anonymity are preventing scientific debate is a red herring. Does Prof Ottersen’s indignation comes from his inability to personally target the person questioning the HPV vaccine? We suspect that, in addition to using the author’s anonymity as a red herring to prevent scientific debate on the article, KI has reasons to whip up sentiments against IJME to hide glaring failures of governance in the institute in relation to "Lars Andersson". Between 2014 and 2017, two internationally reputed journals, JoIM and Vaccine, published correspondence from "Lars Andersson" who reported affiliation to KI. The letters in JoIM were in response to a paper in the same journal. A perusal of the JoIM articles shows that "Lars Andersson" had filed a complaint of research misconduct in 2016 against six authors of this paper, five of them affiliated to KI. The complaint was with KI for about a year, after which it investigated these allegations without confirming the identity of the complainant. Let alone a journal published from India, KI did not verify, on its own, the existence of a person on whose complaint it was acting. It would not be wrong to assume that the complainant made a prima facie case for the allegations; without this, KI would not have launched the investigation. In this background, and with KI providing legitimacy to "Lars Andersson", how could JoIM and Vaccine have suspected that "Lars Andersson" did not exist in KI? And how could this question have ever occurred to IJME? The prevention of deception by an author on the name or affiliation requires the joint efforts of many stakeholders, including journals. While IJME has taken full responsibility for what has happened, the attacks on it in the name of publication ethics cannot wish away the ongoing governance failure in the KI, and cannot be used to prevent scientific debate on an article which nobody has proved to be unscientific, except by innuendo. This response demonstrates the obvious fact that the editorial team of IJME is apparently unaware of the most elementary principles of academic publication ethical principles. They are unaware of the importance of why proven research fraudsters should have their publications retracted, and they believe that the importance of being able to correctly identify authors and their academic affiliations of research articles is "a red herring" (see my former post for some of the most obvious reasons for why it is not). This leads me to conclude that the editorial team lacks the necessary competence to manage a well regarded bioethics journal. Which helps to explain why IJME has gone so sadly astray. However, it does not end there. In the closed Facebook group Bioethics International - a forum for explicit professionals and dedicated researchers in bioethics, or advanced students on track to become any of those, a number of additional points were importantly raised, in addition to the ones in my original post. First, the fact that IJME decides to publish an epidemiological article in a politically highly contested field, where research fraud from "antivaxxers" have been numerous, in an ethics journal. The whole point of having journals organised by fields is that this can guarantee appropriate scientific competence among the journal editorial management, e.g., to select suitable reviewers for manuscripts, and to appropriately evaluate reviewer comments. This is very obviously not the case regarding the fake author paper in the IJME: One of the working editors that is named as having handled the paper, Sandhya Srinivasan, does not hold a PhD, while the other, Mala Ramanathan, is a reproductive health specialist with nil research competence in the topical area of the paper (albeit she does hold an Msc in statistics according to informal reports). The only quality screening of the paper was made by one unnamed external expert on statistics, andMala Ramanathan. That is, no research expertise on vaccination, on HPV and cervical cancer, or on epidemiology ever assessed the paper, despite the fact that this was the topic of the article, and the fact that there is plenty of expertise available in those fields. This is, I would say, serious and willful editorial mismanagement of the publication process of a bioethics journal. In the further discussion in the same Facebook group, several members of the editorial team engaged themselves, and demonstrated some further causes for concern, besides what has already been mentioned. First, there were repeated assurances about Amar Jesani, the IJME editor who was responsible for the decision not to retract the fraudulent article, and who also made the initial, ill-conceived response to Ole-Petter Ottersen, having the highest of ethical competence and integrity. When people reacted to that with the appropriate "so what, that does not justify what he's done", the working editors started to rave about a lot of other journals being conned too, basically trying to say that, because of that, the IJME would be right not to retract a proven fraudulent article. All of this, of course, just adds to the already amassing reasons to view the IJME as an unserious academic journal, that has sadly departed from its formerly very promising track for becoming a well regarded publication forum in bioethics. I sincerely hope that the journal's editorial board can swiftly step in and set this sad development right, and if it so does, I will be happy to revise my judgement. But before I end, there is a final twist to the ongoing scandal. As is made clear by the editor, Amar Jesani's first response to Ole-Petter Ottersen, he now is aware of the real identity of the fraudulent author calling him-/herself "Lars Andersson" and claiming affiliation to Karolinska Institutet in order to peddle an antivaxx junk article to what has now proven to be a substandard journal. However, instead of disclosing this identity – what expertise this author supposedly possesses and what research affiliation he or she holds – the editor Amar Jesani continues to keep this a secret. As I said in my former post, the bogus after-the-fact excuse that the author must be shielded from criticism isn't worth the paper it was written on. In addition, as this is a proven research fraudster, it is in the publiuc interest and the interest of the entire research community, to be informed about who this person is. What is worth noting, however, is this: Amar Jesani very obviously finds the combination of the following three actions very important to sustain: (1) let a fraudulent antivaxx article stay in an ethics journal, (2) shield the proven fraudulent author of this article from public exposure, (3) have is editorial team do its best to deflect further critical inquiry into this matter, especially critical assessment of Jesani's own actions. I just let that stay there as food for thought until this matter develops further. It is a recognised challenge of my research field, bioethics, to include and empower researchers and institutions from low- and midlle-resource settings. Since a few years, the leading journal of Bioethics, runs the side journal Developing World Bioethics to address this issue, and over the past few years a number of journals have appeared, based at institutions outside of the most affluent parts of the world with a natural focus on bioethical issue of relevance to such settings, as well as global health related issues. One of these is the Indian Journal of Medical Ethics, that has quickly been rising in the ranks and attracting respect for its consistent work. However, very recently the IJME has been dragged into potential scandal. First, the editor, Amar Jesani, decided to publish an article by a fake author, claiming fake credentials and affiliations, of an obvious antivaxx junk article of the sort that antivaxxers – just like tobacco-industry sponsored scientists used to do regarding the dangers of smoking – are constantly trying to peddle to various journals to create an image of "scientific controversy" around the use of vaccines to fight infectious disease and build public health. The fakes were all very easy to detect, and already the fact that the "author" was not using the email-domain of, and has no profile at the webpages of, the institution (Karolinska Institutet) to which he claimed affiliation should have rung immediate alarm-bells. But then, when this is pointed out, and the journal is alerted to this research fraud, the editor Amar Jesani decides not to retract the article! Instead, the editor appears to have decided to trust the author's obviously bogus explanations for his (?) fraud, and to attempt to counter a, to my mind, quite sound statement on the matter from the Karolinska Institutet president, Ole-Petter Ottersen. The bogus explanations and Jesani's expression of sympathy with them, and Ottersen's stringent response, is to be found here. This very surprising and ill-conceived action of Jesani is potentially extremely damaging for the IJME, and in effect risks to soil the reputation of the entire field of bioethics. The fake author's attempt at justifying the fraud is that he/she has to be anonymous to protect him-/herself from persecution for unpopular views. This, of course, is not even worth the scrap of paper it was scribbled on. The real role of the fraud is to block any investigation into conflicts of interests (the antivaxx movement is nowadays a flourishing industry of quackery), other activities of the author that would undermine confidence in the article's content, and the fact the author lied to the editor, and offered the explanation only in retrospect when the scam had been uncovered should, of course, mean that the editor should have no trust in what the author is claiming. This is a proven fraudster, and should be treated as such. Just as authors lying about ethics approval should have their papers taken out, authors who lie about other things of relevance to the evaluation and assessment of the research have their papers removed. As Ottersen says in his second blog post: an editor of an ethics journal should know this. The editorial board of the journal should immediately and strongly recommend its editor, who has obviously let his personal prestige lead him astray in this matter, to revise his position and act according to the high publication ethical standards expected of a bioethics journal that aspires to be well regarded. Let me, lastly, comment on the possible need for author anonymity for research articles. The afterconstructed reason brough forward by the fake author and that Jesani surprisingly buys, is the idea that is often practices within news reporting. Where, eg., a newspaper may protect sources by keeping them confidential. However, that also means that whatever story is built on this, needs to present suffient additional public evidence, that is open for scrutiny, in order to compensate for the loss of control following source anonymity. This has not taken place in the case of the fraudulent article. Also, the whole spinn about author/source confidentiality is obviously a lie in the present case: Had the author had any such plan, he/she would have honestly and openly contacted the IJME editor about it, and Jesani could have pondered - bringing in the editorial board - the issue. Had they decided to approve such a request, this would have brought with it extraordinarily strong obligations to check the author credibility, CoI, etc. This is not what occurred, however. What occurred is that a con-man defrauded the journal, and the journal editor then decides, against any common sense, to trust said con-man. Unbelievable!